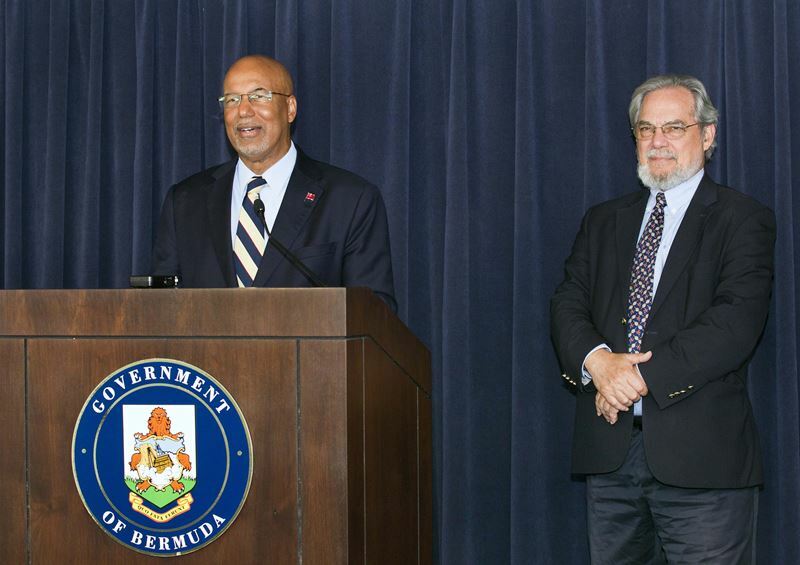 [Updated with video] “As the most recent summonses were written and delivered by the Chairman without prior committee approval, they are not valid,” Finance Minster Bob Richards said today. The Minister’s comments follow after yesterday’s meeting of the Public Accounts Committee [PAC] was cancelled as it failed to reach a quorum as none of the four Government MPs that sit on the committee attended. Speaking after the meeting was cancelled, PAC Chairman David Burt said, “It should be noted that the sole purpose of today’s meeting was to receive the Airport Development Agreement in its entirety, which was required by the summons issued on April 5, 2016. “I have issued a new summons to the Financial Secretary who was in attendance at today’s cancelled meeting, and he will appear next Thursday at 2:30 PM to answer the summons and hopefully produce the contract,” Mr Burt added. Speaking at a press conference today, where he was accompanied by Attorney-General Trevor Moniz, Minister Richards said, ”The Government published the Airport Development Agreement [ADA] on the parliamentary website last year. “More recently, much has been made about the absence of specific schedules from the published material. “The schedules include commercially sensitive information that we cannot release while we are still in negotiations with CCC and Aecon. “Parts of the ADA, which I signed last summer, bind us to keep such sensitive information confidential. This is for the benefit of all parties concerned. “Releasing these schedules contrary to our agreement, would jeopardise Bermuda’s reputation as a responsible and reliable business partner. “Once the parties reach a final agreement, then all documents that relate to our agreement can, should and will be made public. “I was Chairman of the Public Accounts Committee for five  years. I am well aware of established procedures. I know how this Standing Committee of the House of Assembly is supposed to work. “During my tenure, we inaugurated public meetings and issued summonses – including one to a sitting Minister. “But they were issued with the consensus of the bi-partisan committee – not by the Chairman alone. “As the most recent summonses were written and delivered by the Chairman without prior committee approval, they are not valid. “With regard to the schedules, I need to reiterate that breaching the business agreements of confidentiality would be a serious matter for Bermuda, its reputation and the public interest. Mr Richards does not have control of any civil servant including the FS so his comments are without merit. The FS as a civil servant answers to the Cabinet Secretary not the Minister of Finance. And the PAC can’t issue a summons without the PAC agreeing to it, nor can it demand information that is still bound under an NDA. If indeed the chairman submitted the summons WITHOUT the committees approval; than he is wrong and should be exposed for abusing his position. It is expected that this government honors the request of the PAC committee; but Mr. Burt has attacked this issue from every angle ranging from PLP Meetings to PAC (which appears to be a conflict in the first place but hey it’s Bermuda). Ok, Ill give in. Ill take Trump. We are going to protest ourselves right into oblivion. Because you believe something does not mean you are correct. That is why they have an independent reviewer and the overseas office checking for value for money before anything can be signed off. Despite what the PAC chairman may think and say, Tom date this has been the most above board and transparent project yet. And if the shadow finance minister cannot understand that information that is still bound by NDA’s cannot be released, then we should be thankful he isn’t the finance minister. First, your food business isn’t a PPP, it is solely a private enterprise. With the airport, CCC/Aecon are building these facilities for us, but instead of us paying for it directly, they will be paid from the revenues it produces, so if the revenues fall short, then we will have to make up the short fall… and only the shortfall because they paid to build it to begin with and need to be paid back. Just like any loan you would take out for your food business. They would only be eligible for a certain amount from those revenues, so just as we would be responsible for shortfalls, we would gain any excess beyond what is owed. We need a new airport, one befitting of the notion of a world class business and tourist destination we try to market ourselves as, and either way, we would have to pay out for it, but this way, we won’t be responsible for any overruns that are an inevitable with any construction project a government might try to run. A tender process does not guarantee value for money, a robust and well defined construction contract will do that, and that is what is being negotiated now, and what has to meet the Deloitte report and overseas office scrutinization before it can be signed. Now why can’t we see the whole contract, anybody with even an inkling of what contract negotiations for things like this involves knows that until a final contract is agreed, what is being discussed and negotiate is still under Non Disclosure Agreement (NDA). Which is why I state that either Mr. Burt knows that the government cannot produce these details because of th NDA, and is playing silly bugger and deliberately misleading the people about it; or he doesn’t understand what happens during such high level business contract negotiations, which is just one of the reasons that should make us relieved that he isn’t our finance minister. But when you review all available documentation to date, and not just selected snippets and highlights from the PLP cutting room, this project is looking good for Bermuda. Learn to spell and write properly before you contribute—I might actually read your full post/response and take something constructive from it if I could get past the first line. Bob is doing something with this airport deal and the public need to. Know. Now what it. Is this. So call good. Deal. Will have Bermuda. On the hook for. 30. Years. Looks. Like we. Will have. To. Go back. On. The. Hill again or does sir. John. Have. To take. The. Lead again. That was frank doing his William Shatner as Captain Kirk impression. Priceless. Gets me every time. Have you ever heard of a 100% mortgage? Normally offered when you don’t have a down payment, sound familiar? I am subject to the terms of the mortgage. We have a chance to build a house and put the people in that will use that house to work. What. The. Heck. Is. Up. With. All. The. Per.io.ds.???? I believe it’s T.S.S.D.D. being promoted by those on the “other side” that don’t want Bermuda / Bermudians to move forward Shame but true. wow Ray its always the other side, why cant the citizens question this gov’t? seems like we should just know our place ???? Exactly, this guy has serious issues. This Airport Deal is a farce and people need to realize this and put an end to it. I wish people knew what was going on behind the scene, they would hang this govt. out to dry. And things would be so much better under the lying party. LoL the OBA ministers are a joke !! Their reputation already stinks !! From the day they were elected till now , how many times have they ” not told the truth, mis lead , hoodwinked us the tax payers ?? We gave them our trust only to be filetted like a fish ! Smdh ! They complained about the PLP only to do what they said they wouldnt do . Some choice the voters made in good faith . We will have a change in government Next time around !! By by Bob !! N take the wanna bees with You ! The measure of a man is not finacial or material wealth ! And that my friend will be the end of Bermuda as we know it! Mass Exodus! Good I hope you are the first one… Bye bye… We will survive , we always do. I and many others I’m sure totally agree with you “Hoolieh” What would anyone expect to hear coming from the Opposition or any supporters of them? Thank you OBA for endeavouring to take us forward,from under the increadable financial mess that the last administration have left us in. They certainly left our children and grandchildren a HUGE DEBT. But there is hope,just go to the AG SHOW and see the creativity of our youngsters as it is wonderfull. If I ever receive a summons…that is what I am going to say! This damn thing needs approval by a committee damn it! The PLP are absolutely convinced that redeveloping the airport will be rife with corruption. I wonder why. This IS a form of CIVIL DISOBEDIENCE . Ironic, how this government is of the behaviour that they can do whatever they want, EVEN IF IT IS TOTALLY WRONG!!!!! That commission of inquiry which is to materialize in June 2016 is fine to be put in place BUT when the OPPOSITION challenges….. IT IS WRONG?? Get a grip oba(U.B.P. )…..Fair is fair. Hey! This is a democracy, correct?? TO jt: Clearly NOT A BORN BERMUDIAN. Read up on that……a johnny come lately person. Yes democracy, so the whole of the PAC must agree to issue a summons, not just one individual… did the PAC vote on the summons? Yeah….that’s not how PAC works. See? the nerve of some people. the govt has the mandate of the majority …. I didnt appreciate the debt and shaky ground we were on so I voted for my beloved PLP to take a back seat. If financial growth continues into 2017 election promises are kept and the majority of Bermudians are benefiting, the the OBA will continue their work as the govt. Fair enough…but breaching a summons issued by a magistrate is flouting law is it not? Trevor …your presence as attorney general is as an attorney …magistrates are sitting authorities ennit? PAC is doing a pack…lol. When are fey & dunk going to resign ?